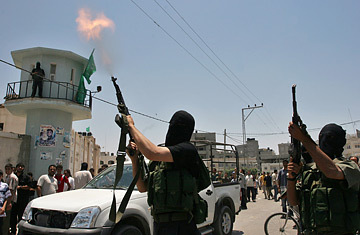 Palestinian militants from Hamas fire in the air as they celebrate their capture of the preventive security headquarters from Fatah loyalist security forces in Gaza City, Thursday, June 14, 2007. The fall of Gaza to the fighters of Hamas has dealt a serious blow to U.S. policy toward the Palestinians. Thursday's announcement that President Mahmoud Abbas will dissolve the Palestinian unity government headed by Hamas and call for the deployment of an international security force in Gaza appears to confirm that the Islamist movement has decisively won the vicious battle for control of the territory that has raged between its forces and those of Abbas's Fatah movement for the past four days. Though Abbas's decision to disband the government is unlikely to be accepted by Hamas  which won the last Palestinian elections in January 2006  the outcome of the battle effectively leaves the Palestinian Authority politically partitioned. Gaza is in the hands of Hamas, while Fatah rules the West Bank, and the prospect of turning this entity into a Palestinian state alongside Israel appears even more remote than at any time since the failure of the Camp David talks in 2000. Israeli leaders are considering their options in dealing with the reality that Abbas, with whom Washington wants Israel to pursue a peace deal, has lost control of Gaza. And the U.S. policy of bolstering Abbas's authority and prestige in order to weaken the Islamists and restore Fatah to power has suffered a serious setback. The U.S had spent millions of dollars training security forces that were supposedly disciplined and loyal to Abbas, but as Hamas militia advanced across Gaza this week, many of these simply cut and ran; at least 40 officers of Abbas's elite presidential guard blew a hole in the Israeli security wall corralling Gaza and fled into Egypt. Hamas' conquest of Gaza may now be a fait accompli. By Wednesday, hundreds of Fatah forces loyal to Abbas had either run out of ammunition, fled or been cornered into surrender. Thousands of others simply melted away. And the rout appeared nearly complete on Thursday when the third of four major Fatah command centers in Gaza fell to Hamas. President Abbas himself was in the distant West Bank town of Ramallah (as were many of his senior commanders), far from the fighting. In Gaza, the 18,000-man police force on Abbas' payroll failed to help the president's men. One Western diplomat, when asked if there were any concentration of Fatah commanders still left in Gaza, replied sarcastically: "No. But try Switzerland, or their mansions in Kuwait." From the safety of Ramallah, Abbas urged the Gaza fighters to halt "the madness." But it was too late for that; sensing victory, Hamas shrugged off efforts by the Egyptians and others to press for a new cease-fire. Events in Gaza were "a source of profound concern," said White House spokesman Tony Snow on Thursday, accusing Hamas of "once again committing acts of terror, now against the Palestinian people." For months, Abbas, urged on by U.S. advisers, had been strengthening his security forces in Gaza. But Hamas was not idle during that interlude. The well-disciplined Islamists were busy plotting for this final assault, stockpiling ammunition, mortars and tons of explosives. They drew up lists and established the whereabouts of senior Fatah officers to be executed, positioned snipers on tall buildings around rival outposts and even tunneled under Fatah security headquarters in Khan Younis, where on Tuesday Hamas blew up a one-ton charge of explosives, killing 13 people. "We are fighting for our faith," one Hamas spokesman explained to a radio interviewer, "and Fatah are fighting for their salaries. That is why we will win." Israeli officials say Washington had tried to avert the rout of Fatah in Gaza by pleading with Israel to rush in a new supply of arms. But Israeli intelligence sources told TIME that Prime Minister Ehud Olmert's office refused to help Abbas, fearing that the arms would fail to make the difference and would end up in the hands of Hamas. Western diplomats blame Olmert's government for consistently undermining Abbas, thus strengthening the Islamic militants. "Israel has one policy with the Palestinians," this diplomat said, "And that's 'Keep them weak'." Olmert is expected to meet with President George W. Bush in Washington next week, and may face a grilling over why he hasn't done more to prop up the moderate Abbas. "For the Israelis to say that Abbas is 'weak' is a self-fulfilling prophecy. They've helped to weaken him," this diplomatic source commented bitterly. On the Israeli side, one senior intelligence official told TIME: "Nobody here is sorry that this [fighting] is happening. We know of at least six known Hamas terrorists who were killed. Having Hamas solely in power will turn Palestinians against Hamas." Israeli officials are also mulling over whether to ask U.N. peacekeepers to monitor Gaza's border with Egypt to prevent arms being smuggled to Hamas, although it is doubtful that either Egypt or the U.N. would agree to such a move. Meanwhile, the factional war spread into the West Bank city of Nablus, where Fatah and Hamas gunmen exchanged fire throughout Wednesday. Palestinian radio also claimed that Fatah gangs had kidnapped several prominent Hamas members to use as leverage. Israeli intelligence sources and diplomats say that the fighting may not prove as fierce in the West Bank since the territory is under Israeli watch, and Hamas fighters, who have operated largely underground, possess fewer weapons. In Gaza, locals report that areas under Hamas control were safe, aside from stray bullets. During the day, over a thousand Gazans marched in protest against the factional fighting but swiftly dispersed when Hamas, according to several eyewitness accounts, fired into the crowd, killing at least one protester. After two United Nations workers were killed in crossfire, the U.N. on Wednesday announced it was scaling back its massive aid program to many of Gaza's needy 1.5 million Palestinians.